This novelist and translator is one of the best and most popular writers of the past two decades. His most highly acclaimed work, We Might be Going, was named Book of the Decade in the Magnesia Litera competition. Ask Dad won Book of the Year in the same competition, as well as the Lidové noviny newspaper’s Book of the Year and Respekt magazine’s Book of the Year. 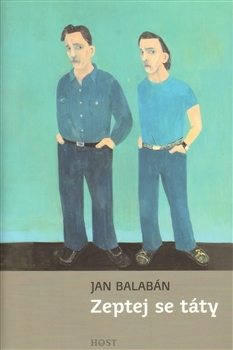 The crux of Jan Balabán’s novel focuses on dying and death even though its inherent plot centers on the painstaking pursuit of life, which first has to be found in its depth or reinvented. In a sense, we are all somehow similar to the characters of this extraordinary, vibrant story replete with dialogue, soliloquy and silence. A story which searches for truth only to find sincerity. In our temporal existence, we are trying to discover something about the quintessence of actuality or be near – at least momentarily – to something substantial. It has been published in Sweden and Poland, and Bulgarian and Serbian editions are in the pipeline.